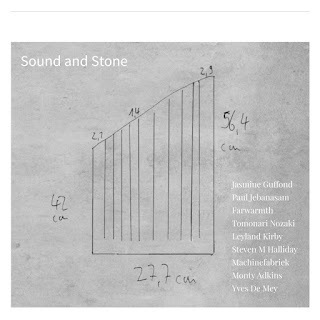 Sound stones are sonic sculptures created by the father-son team of Klaus and Hannes Fessmann (you can learn more about them via this You Tube video. This recording, I believe the first on the composer-built imprint, collects interactions between the stones and nine musicians. The stones themselves, wetted and played by rubbing with one's fingers and hands (possibly bowed and/or struck as well? ), produce a range of ringing tones, sometimes with a pleasing roughness to them, other times more pure--depending on the instrument used, the tones, their pitch range, etc. varies. But generally speaking, we're in drone territory, sometimes augmented by electronics. Depending on how they're handled, they can lend themselves to music that's a bit too close to Eno-esque New Age for my taste (Farwarmth) or wonderfully dark and ominous (Machinefabriek, aka Rutger Zuydervelt). I'd also single out Monty Adkins' contribution for special praise. Most of the the others fall somwehere between these poles, always enjoyable and compact (playing times in the five minute range) with greater or lesser graininess, not too distant from what listeners may have experienced via labels like Unfathomless. You can hear for yourself at the bandcamp link below. A solo percussion effort from Costa, two long pieces and expertly handled. 'I' is expansive, flowing and very well-paced, keeping on the quiet side of things while patiently exploring a vast array of instruments large and small. 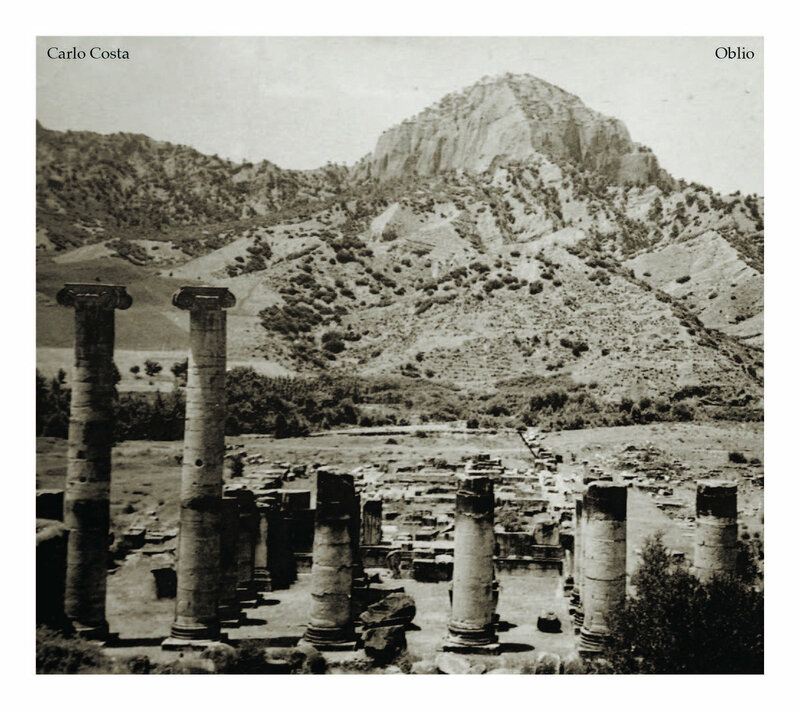 Costa constructs a convincing landscape, entirely without pyrotechnics, maintaining interest with both delicacy and urgency. 'II' employs wood blocks, high-pitched bells and some swirling, metallic based attacks, more structured (though loosely enough), recalling to some extent the late Jerome Cooper's brilliants solo concerts. It "decomposes" into a section of harsher rubbing, somehow melancholy, drifting into plaintive moans. Very good work, well worth a listen when it releases on November 6. I need to write a brief aside about my listening experience over the past few decades. Many regular readers know it, more or less, but as I anticipate that to the extent this review is shared among those not familiar with my history and shifts in taste over the years, it might be a good idea to clarify. Essentially, since 17, I grew up with an abiding love of jazz, particularly what one might refer to as post-Coltrane jazz; my first jazz album purchase was Ornette's 'Science Fiction' in the spring of 1972. While entirely immersed in this for some 15 years, by the late 80s, I was beginning to sense a lack of new, innovative work. I loved the music of the previous 60-70 years as intensely as ever but, even among musicians who I greatly admired (for example, Roscoe Mitchell, Cecil Taylor, etc.) I increasingly got the feeling that they had done their great work and were now just elaborating on themes they'd developed as relatively young men. This was all well and good--few people have even one great idea in their lives and these folk had a number of them. If they settled into comfortable middle age, I've no reason to complain. But I found myself devoting more of my listening time to music in the post-AMM improvising tradition, the post-Cage "classical" tradition, various music from around the world and more, at the expense of keeping up with developments in jazz (definitional issues with the term aside). I'd dip in now and then, go to the occasional gig. Sometimes, I'd be pleasantly surprised. I recall duo performances at the Vision Festival--Fred Anderson/Harrison Bankhead, Bill Dixon/George Lewis, Barre Phillips/Joe Morris--that were spectacular and hugely moving, but more often, much more often, I'd have the sense of musicians more or less going through the motions. They were good--usually very good instrumentalists, had a huge command of their chops, but the new ideas were few and far between, at least to the extent I could discern. Needless to say, I doubtless missed many a counterexample but one only has so much time and I chose to dwell in areas where my "success" rate was much higher. 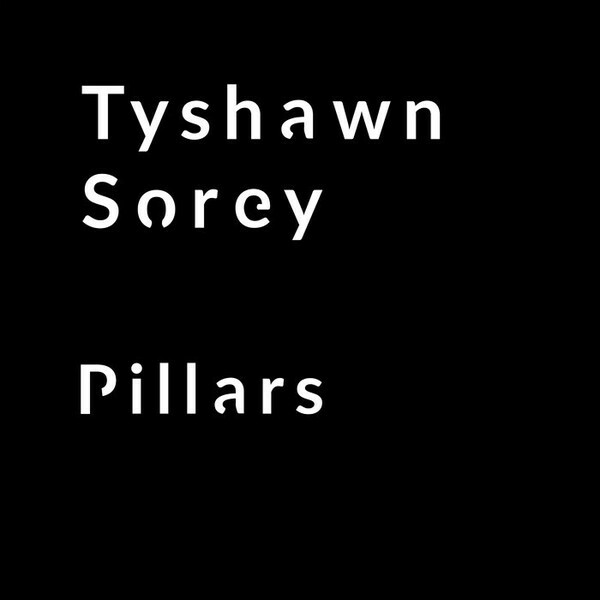 All the above to explain my background with regard to Tyshawn Sorey's extraordinary release, 'Pillars', a single composition spread over three CDs, clocking in at ten minutes shy of four hours. I only knew Sorey as a name, associating him with Mitchell and Anthony Braxton, but had never heard any of his music; my loss, no doubt. I was, in fact, surprised to find this release in my mailbox but I'm very happy it turned up. Sometimes there are manifestations of ideas that occur, burn brightly but evanesce without incurring any follow-up investigations. Michael Mantler's 'Communications' from 1968 always struck me as a prime example. Barry Guy, with his London Jazz Composers Orchestra, attempted to pick up the banner and move it forward, with some arguable success but, in my mind, it remains fertile, untilled territory. Another area was explored by Bill Dixon, particularly in his 'Vade Mecum' sets. 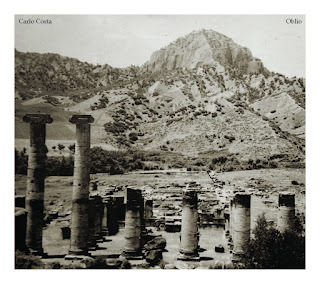 My first overriding impression from 'Pillars' was, "Ah, at last! someone's extending Dixon's idea." I think that's part of what in play here and it's no small thing. Sorey's conception is immense, not simply in terms of length but in spreading a general idea across that span, music that has its composed or preset portions but moves seamlessly enough between those and the (I suspect) longer improvisatory sections that the listener quickly loses much in the way of "episodes" and goes along with the flow in a manner similar to an AMM performance (although the music sounds much different). The notable exception are the three "signposts" that conclude each disc, ultra-low, long tones played by Sorey on the dungchen, a long, Tibetan ceremonial horn. The ensemble deployed, arrived at after several years of work on the piece, has a great deal to do with the overall sound of 'Pillars', deep, dark and rumbling: an octet consisting of Stephen Haynes (trumpet, flugelhorn, cornet, alto horn, small percussion), Ben Gerstein (trombone, electronics), Todd Neufeld (electric and acoustic guitars), Joe Morris (electric guitar, double bass), Carl Testa (double bass, electronics), Mark Helias (double bass), Zach Rowden (double bass), Sorey (conductor, drum set, dungchen, percussion, trombone). The consistency of the group sound, its elasticity and molding of form, is one of the true marvels of this release. Describing it in detail is a fool's errand. It's so much "of a piece" that any detailed description necessarily misses the point. A few moments: It begins with a pure snare drumroll that lasts several minutes, an opening incantation perhaps and an element that doesn't reappear. We then plunge into an amorphous zone, a cloudy, darkly rambling area with Sorey's deep percussion undergirding an intriguingly clangy guitar. As is, it's attractive if not too unusual--some of Dixon's atmosphere, the guitar maybe recalling the way it's been used in Threadgill's music. But that episode is broken off much more quickly than I'd have expected and the music shifts, smoothly, without awkwardness, to an adjacent territory, darker still. I'll pause to note the wonderful timbral differences in the percussion--the range is enormous but never seems forced or extravagant, always enhancing the general sound. There are dynamic surges and they too seem natural--none of the automatic vaulting into high energy so common among many groups, everything paced and well considered while retaining elements of roughness and surprise. And this is all before the massed appearance of the basses and trombones. From here--and we're only some 18 minuted into Disc One--we begin to approach the real meat of the matter. Throughout, the basses, arco and pizzicato, are used brilliantly, from huge swarms of buzzing to elaborately intricate plucked interweaving, often played off the deep brass (even Hayne's trumpets, etc. tend to be pitched low). Sorey writes in the accompanying notes, "Low frequencies seem under-explored in improvised music. 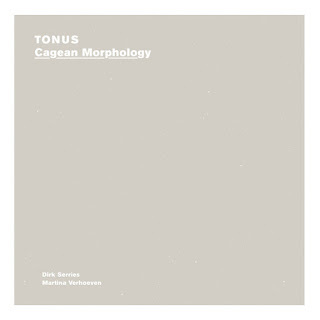 But I wanted to go there, trying to achieve a physical depth of tone and hypnotic drone". That "drone" isn't what many listeners have come to think of; this isn't Radigue. It fluctuates far too much for that, but retains an underlying sense of flow. Not explicit pulse, but underground river flow, disappearing from overt view on occasion but leaving traces that it's still there, below the surface. Other referents are tough to come by. There are times when I'm reminded of early Art Ensemble explorations, maybe something like 'How Strange/Ole Jed'; Haynes evokes Bowie more than once and, as mentioned, the spirit of Bill Dixon certainly hovers over the proceedings. There are also points, few and far between, when something of the typical over-busyness of many a free jazz improviser surfaces, but those episodes flicker briefly and are soon quelled. Electronics, sometimes dense and active, more often subtle, are integrated very well, growing out of the acoustic ensemble, never feeling added on or used for superficial effect. Again, trying to think of comparisons, perhaps a pointless endeavor, I come up with...Simon Fell? Maybe? But Sorey's work really stands apart. His ability to maintain not just interest, but fascination over such long duration is amazing. Even if I had the odd quibble about a given patch of music, my interest never came close to flagging. I've listened through three times now, have found new details and relationships on each listen and expect to for a good while. 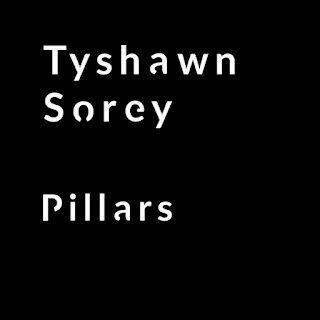 I imagine 'Pillars' will provide rough sledding for listeners more attuned to music in stricter lineage with contemporary experimental jazz--there are few easy footholds. But I'm more interested in getting those listeners in the post-AMM, even Wandelweiser tradition to give this one a try. The music isn't like those, but offers possibilities, beautifully realized here, for parallel investigations that may prove every bit as rewarding. 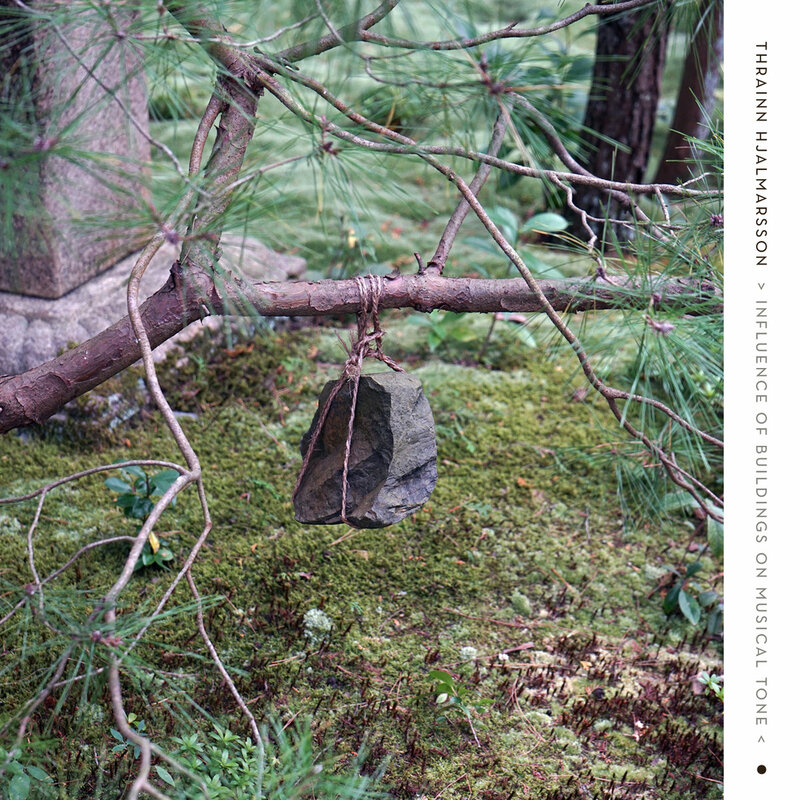 A very exciting release from a composer new to me, Thrainn Hjalmarsson, from Iceland. Five pieces for varying ensembles (and solo), all rather complex and tough to describe. The title piece, performed by the Caput Ensemble (violin, viola, cello, bass, two percussion) skitters and dances in a light but gritty manner, pausing some fairly intense activity for soft, grainy, whistling observations by the strings, punctuated by breathy exhalations--eerie and precisely limned. 'Grisaille' finds the Icelandic Flute Ensemble (a dozen of them) navigating through a slowly swirling, misty world, the flutes creating gorgeous, otherworldly harmonies, breathed in and out in (very) rough unison, gradually splitting into higher and lower sections, gently seesawing. True to its title (a painting in gray tones), it remains in a single area and explores it wonderfully, a compelling work. Violist Krista Thora Haraldsdóttir is the solo performer on 'Persona', all ultra-high whispers, indeed often sounding flutelike. Careful and delicate, but sinewy. Ensemble Adpater, a quartet with flute, clarinet, harp and percussion, lopes and hops through 'Mise en Scène', valves softly popping, pausing for a quiet, long flute tone, percolating along again, encountering blurry clusters of backward-sounding phrases. Again, mysterious and very enticing, evoking image after image. Finally, my personal favorite, 'Lucid/Opaque', played by Nordic Affect, a violin/viola/cello trio. In and out breath is once more the structure, a three pulse phrase, very simple (but massive complex within the chords), low-high-low, iterated over and over with small shifts in individual duration, tone and attack throughout and occasionally punctuated by brief puffs. A sleeping dragon? Hjalmarsson again stays within a narrow territory but augments it and works it to a marvelous degree, every addition or new angle perfectly apt. It's an immensely moving piece. An LP issue by this powerful trio. As one might expect, rich, harsh electronics are the order of the day but very finely focussed, like some otherworldly, arcane machine. More swirling than harsh, betted by the unexpected wielding of an alto saxophone by Zaradny amidst the dense electronics. A good deal of structure underlying the chaos, with a fine break several minutes from the end of Side One ('The One Who Searches for Cracks') that leads to a thrilling conclusion. The other side, 'Universal Atlas of Evidence' uses a bending, elastic substrate to support more alto excursions and dozens of other bits and pieces besides. 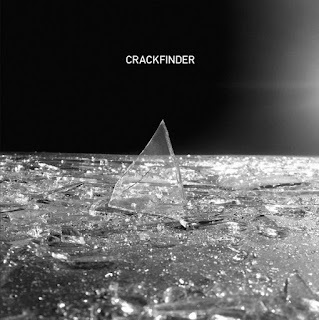 It's a bit more "spacey", perhaps a little less visceral than the previous track, but rewarding. It, too, has a pause some four minutes from its conclusion, whereupon it veers into darker, more anxious and warped territory. Good work from all involved. Three excursions (available for download purchase) from Norwegian trumpeter Lund. When the title track begins, we're in reasonably familiar territory, Lund ably playing in the manner of any number of post-Bowie trumpeters. But soon there's a heavy flurry of electronics, aggressive and semi-droney, Lund seemingly triggering some sounds, playing through others, those waves changing character to clanging reverberations. It splinters out from there, becoming denser and more propulsive, the "normal" trumpet seeking to be heard through the walls of noise. Well done. 'White Mass' is a small, involuted knot of gurgling noise, a strong balance of cohesion and random strands, growing quite harsh toward the end. 'The Great Equalizer' begins with jagged echoes before lurching into what an innocent listener might guess is a fuzz-laden, slow guitar intro to a death metal dirge ("noise" on this track is supplied by Bjørn Ognøy). 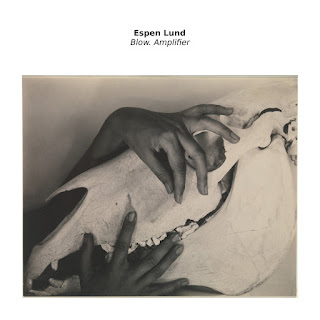 The overt rockish references I could likely do without but Lund handles them quite well, spreading the sound like dark paste over almost 15 minutes, grinding to a fairly spectacular conclusion. Good, exploratory work. The single 26 1/2 minute piece begins with high-pitched, iterative electronics, kind of related to the sort of sounds you might hear, or imagine hearing, when two communications systems are interacting, except multiply layered. Alien and a bit disorienting. There's a pulse but the patterns seem ever so slightly staggered, gradually overlapping and muddying the rhythm. Sometimes the music reminded me of Terry Riley's 'In C', for a severely limited range of instruments (Reich's glockenspiels come to mind as well). A very low, very quiet and subtly quavering hum emerges as the primary tones continue to, very slowly, blur and mingle, but then recedes. The elements coalesce into a smooth but fluctuating hum, then cease. A fine, concise, no-nonsense piece of work. Ok, the label name is unfortunate. The three items above are the first I've heard from this imprint and, as it happens, the music has little to do with jazz, though I take it from looking through the label's catalog that prior releases do. 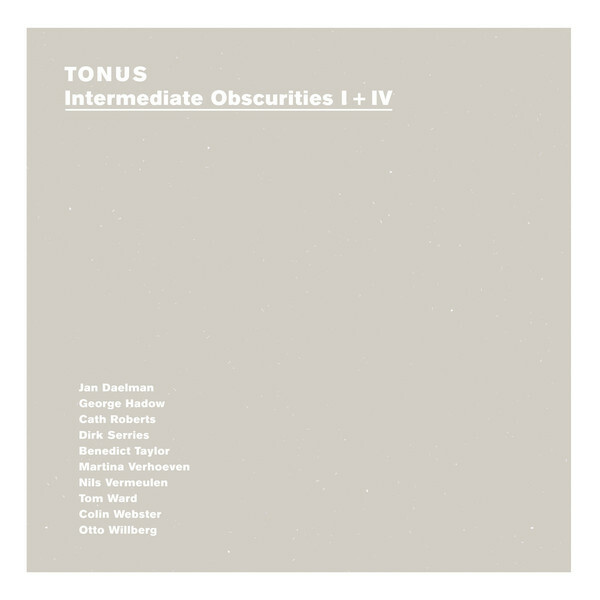 Tonus seems to be a project of guitarist Dirk Serries, the personnel varying from album to album, in these cases from duo to trio to two sets of sextets. 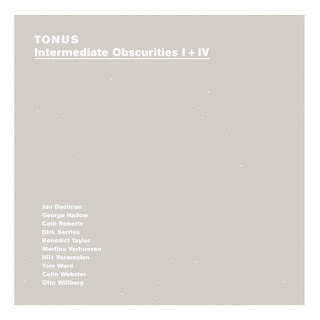 'Intermediate Obscurities I + IV' is a two-disc release, performed by those sextets. 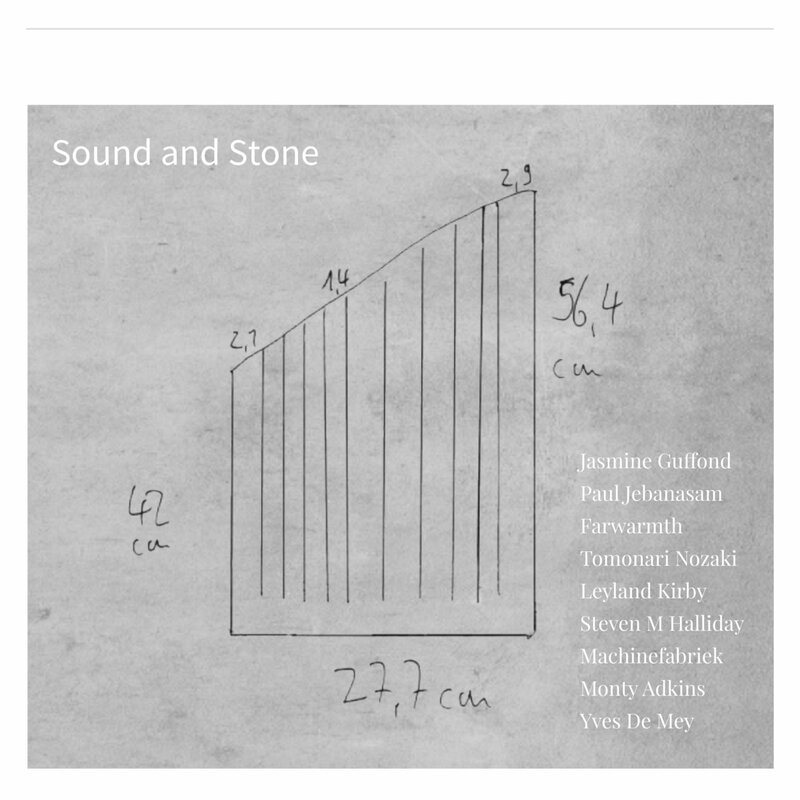 On 'I', listed as being "based on a leitmotif by Martina Verhoeven', the ensemble has a superficial jazz-like aspect: Jan Daelman, flute; George Hadow, drums; Serries, acoustic guitar; Verhoeven, piano; Nils Vermeulen, double bass; Colin Webster, alto saxophone. If I were searching for any quasi jazz-related music to compare with this 58-minute work, recorded live, maybe I'd go with some of the sparer Roscoe Mitchell. Carefully composed, softly played longish lines overlap in ever-changing patterns, the tones ranging from clear to harmonics-laden (especially the arco bass, sometimes the alto). The flute and alto tend toward the higher registers, never harsh, the percussion arhythmic and sparsely colorful, the piano and guitar injecting slightly acidic chords as needed. The basic character and approach is maintained throughout but the interior details are constantly shifting. It only moves internally, but that movement and the choices made are engrossing. 'IV', a graphic score by Serries, utilizes an ensemble with Cath Roberts, baritone saxophone; Serries, Acoustic guitar; Benedict Taylor, viola; Tom Ward, bass clarinet; Webster, alto saxophone; and Otto Willberg, double bass. 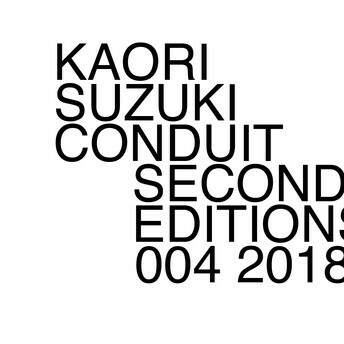 There are certain similarities with the previous work: a single piece, here about 45-minutes long, remaining in more or less the same territory for its duration, the instruments playing longish, overlapping tones. But, perhaps via the instrumentation, it's pitched lower, darker and, to no small degree, more sumptuously. When the baritone, alto (played low) and bass clarinet combine in complex harmonies, the effect is quite luxurious. There are also occasions where the intensity level surges, though not for long. Some listeners might consider the two pieces overly akin. I don't have that problem at all and hear them as related, but entirely distinct and very absorbing entities. 'Texture Point' presents four tracks, performed by Serries (acoustic guitar), Verhoeven (piano) and Taylor (viola). There's no indication of compositional credit given here, so I'm guessing the pieces are improvised (Guy Peters, in his liner notes--he also wrote them for the other two releases--is a little defensive here, as though writing for listeners unused to this atmosphere), though the three "textural" pieces are indeed that while the single pointillistic one lives up to its title. 'Texture I' offsets deep notes from the piano, lending the music a darkly romantic, even gothic aura, with mid-range, rich plucks from the guitar, both sliding alongside rougher scratching, bowing and rubbing from the viola. 'Textures II' is more vibrant, the piano crystalline, though the viola is more somber, with low, wailing laments. The pointedness of "Point A" resides in the piano and, especially, the guitar--the viola casting skittering harmonics that swirl around the two more stationary sound emitters, the music growing harsher as it progresses. Finally, 'Texture III', returns to the rich bleakness, both the guitar and piano plucking dry tones against sustained, darkly questioning, isolated piano tones. A very impressive recording. The third release, 'Cagean Morphology', is a duo with Serries and Verhoeven, a single 34-minute piece. Again improvised, this is easily the sparest of the three offerings, the single, ringing tones of the instruments allowed to hang and decay, leaving much silence. One picks up the likely influence of the Wandelweiser school here. As with the previous works, the music remains consistently within one "space" throughout and, again, manages to offer patterns, exceedingly slow as they are, that subtly vary, more than maintaining the listener's interest. Toward the end, the piano hits several high, brilliant notes while the guitar answers with more hesitant, wavering ones--very lovely. All three recordings carry a fine quality of perseverance, of sustaining an idea over a long time, closely investigating aspects encountered, a favorite approach of mine. Highly recommended. Since 2009, Daniel Crokaert's Unfathomless label has been releasing music that, by and large, revolves around the nexus of field recordings and electronics. In one sense, you're pretty sure of the general area to be explored when first slipping a new disc into the player. In another, he and the musicians tend to do an excellent job of exploring the vast amount of potential variation within such apparently restricted environs. 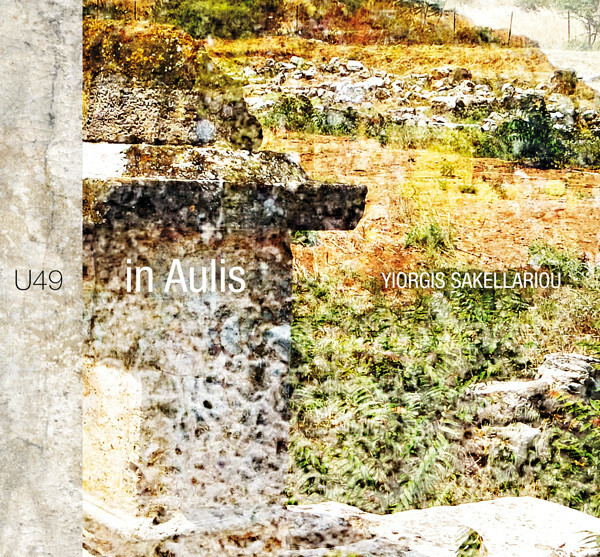 Yiorgis Sakellariou brought Aeolian harps to the site of the Greek temple of Artemis in Aulis, Greece, recording (and, I assume post-producing) their interaction with the wind, in the process picking up other ancillary sounds. That contrast, between the wooly, whistling, windborne atmospherics and the rougher (though always blurred) booms and bangs, forms the basic structure of the 43-minute piece. But there's much more, many shifts in focus and mood, from quiet contemplation replete with crickets to dully roaring, grinding, somewhat threatening cycles ending with a sharp crash of glass. Subsidence, resurgence in different guise; there's a wavelike effect throughout, relatively clear or detritus-filled, a fine combination of the natural and manmade. A very well thought-out effort, overall. 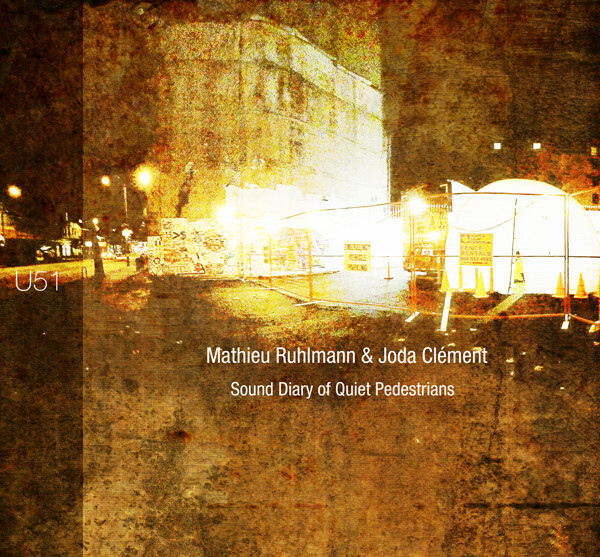 Canadians Ruhlmann and Clément constructed the four pieces that comprise their "diary" in Vancouver. A photo in the accompanying sleeve shows the pair on a beach, but there's something vaguely industrial about the sound-world created here, a hint of ozone in the air. At the beginning of 'Crook of Land', deep thrums are offset by a distant buoy (? ), steamy hisses and bell after-tones. 'Gore and Hastings', the longest track, is very expansive, unfurling in a multilayered array of burred, marbled sounds before migrating to harsher tones that recall bowed cymbals, then sputtering, returning to a harborlike area with softly booming foghorns and urban hums. The anxiety level ratchets up a bit on 'Point-No-Point', with higher pitched, keening whines set against (again, faraway) machinery clanks and groans; a very strong track. The disturbingly titled, 'Middle Arm' extends this mood, a kind of inky, billowing darkness emerging, swallowing the bay. Excellent work, fine soundcraft. I think I've only heard one thing from Jerman in the last few years ('Matterings', his collaboration with Tim Barnes on Erstwhile) and prior to that, nothing since around 2010, though I have plenty from the oughts. 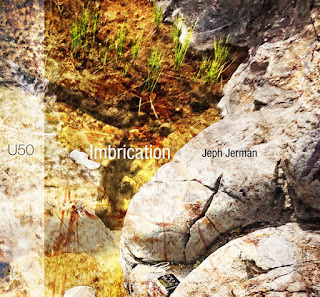 Even so, 'Imbrications' (yes, I had to look it up: the overlapping of edges, as in tiles or scales) fits in very well with my previous Jerman-ic listening. Recorded at various sites that seem to cluster around the American West, it begins with a long section of dry objects rubbed, rustled and otherwise gently assaulted. As ever, Jerman possesses an uncanny sensitivity and sensibility in his choice of objects, touch and sound placement, something very "natural" but also quick and unhesitant. An interlude of booming noises, sounding as though he's smacking the edge of his fist against an empty oil drum briefly shifts the focus, before the raspy shaking and rattling resumes. There seem to be machines or rotating devices in play, recalling the shaking tables used in his fantastic 'Lithiary' (Fargone, 2005) and the work closes with echoes of that, what sounds like marbles being rolled around the top of a rough, circular surface. Jerman is wonderful at extracting a nearly infinite amount of sounds and layers from the most basic of substances. He does so once again, here.